Learn to make this favorite late 1800s quilt, Bow and Ties, using the simple method of connectors. 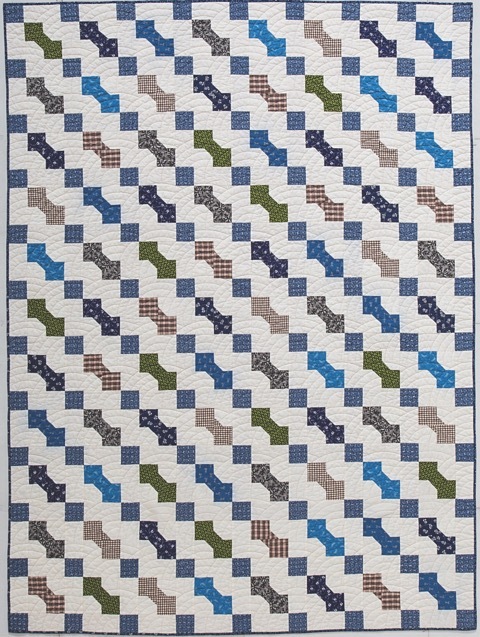 This is a perfect beginner class, a simple pattern with a technique that the student can use in piecing other blocks. Students will make some blocks in class, then return next week to construct the top. Single session: 3 hours to make some Bow Tie blocks. The student finishes the top at home. Double session: 2–3 hours to make some Bow Tie blocks and 2–3 hours to construct the quilt top. Have premade Bow Tie Block pieces made for examples. Students will cut one color set of Bow Tie block pieces. Instructor will demonstrate how to make a connector block, the knot of the bow tie. Instructor will demonstrate construction of the Bow Tie block. Students will construct their own Bow Tie blocks. The rest of the class will consist of students making as many Bow Tie blocks as they can in the allotted time. If the class is only 1 session, the instructor can explain to the students how to construct the top. Have a premade Bow Tie block for an example. Have premade Bow Tie block pieces for examples. For the second session, have the cornerstone and sashing pieces cut for demonstrating the construction of the quilt top. The rest of the class will consist of students cutting out Bow Tie blocks, making as many blocks as they can in the allotted time. Students will need to complete construction of all Bow Tie blocks before the second session. For second session, students will cut out cornerstone blocks and sashing blocks. Students will lay out the entire top for approval. When the top layout looks good to the student, they will begin to sew the top together. Students will get as much of the top sewn together as they can before leaving.